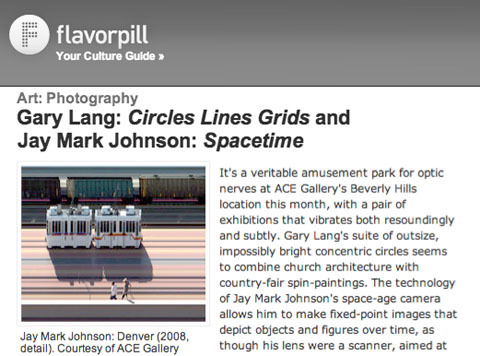 FLAVORPILL: Gary Lang: Circles Lines Grids and Jay Mark Johnson: Spacetime was posted on September 6th, 2009 at 12.20pm and is filed under PRESS. This entry has no comments (yet). You can follow any responses through the RSS 2.0 Feed. It’s a veritable amusement park for optic nerves at ACE Gallery’s Beverly Hills location this month, with a pair of exhibitions that vibrates both resoundingly and subtly. Read Shana Nys Dambrot’s full review here.